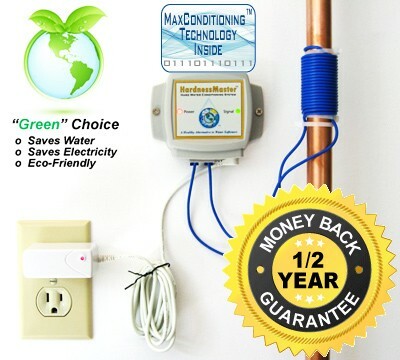 The No-Salt or Salt-Free HardnessMaster™ Premium Whole House Electronic Hard Water Conditioner & Descaler System utilizes latest MaxConditioning™ technology and provides a healthy and eco-friendly solution or alternative to a salt-based water softener for Hardness, Scale, Calcium, Limescale and Hard Water problems . 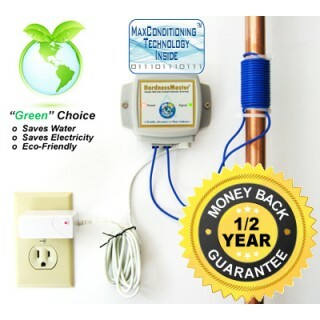 This simple and easy-to-use system, which works with copper, PVC, CPVC, PEX or rubber, handles city or well water hardness up to 50 grains per gallon (or 50 gpg or 855 mg/L or 855 ppm). "This Hardness Master system is the best thing I have ever bought to get soft water. I set it and forget it. I don't have to worry about water leaks or running out of salt. Thank you for making my life worry free." Need help deciding or ordering? Call us anytime Mon-Sun at 1-877-284-5042. The HardnessMaster™ is an excellent choice for homeowners who want soft water but don't want the salt contamination or maintenance effort and expense for ion exchange softeners. This is a great way to soften (condition) water up to 50 grains per gallon (or 50 gpg or 855 mg/L or 855 ppm) of water hardness. 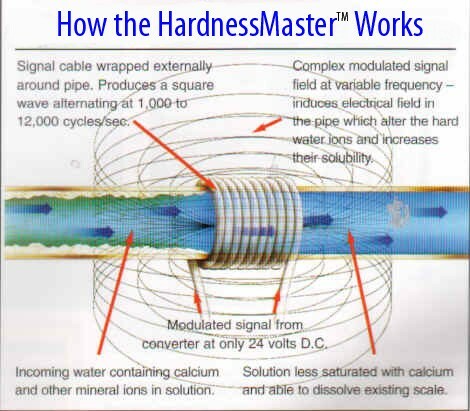 The HardnessMaster™ uses about 6 watts of electricity to operate, works effectively with copper, PVC, CPVC, PEX, rubber, lead, and steel/galvanized steel pipes. 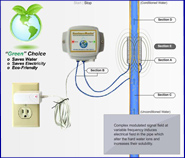 Includes 3-year warranty and our 100% Satisfaction Guarantee. The Vitasalus HardnessMaster is the most advanced, effective and affordable system available today! See why our HardnessMaster is so popular. "I love this softener! The water in Las Vegas is hard (18.3 gpg or 313 mg/L (ppm)). I bought the Vitasalus HardnessMaster with skepticism. I installed it in five minutes and said 'We'll see how it works'. In two days time I felt a difference! After the third day and a couple loads of laundry I could literally feel and see the difference in my clothes and around the sink and shower. I am only sorry that I didn't find the HardnessMaster sooner. I've told all my friends about the Hardness Master. Do yourself a favor and get one today!" If you have hard water (i.e., scale, limescale, "white deposit", calcite, calcium, magnesium), please check chart below for our recommendations regarding any other possible water conditions that you may be experiencing. If you believe that your water condition(s) involves iron and NOT limescale, we would advise you to consider our MetalMaster™ recommendations below, instead of the HardnessMaster. PLEASE NOTE: The systems we offer may be connected together in different ways to collectively address one or more water conditions. Manganese, Tannins, Nitrates, Nitrogen, Fluoride, pH Balancing/Neutralizing, Lead, Uranium, Mercury, River Water, Pond Water, Lake Water, Ultra-Violet (UV) Disinfection, Micro-organisms, Bacteria, Parasites, Cysts, Chlorinator/Chlorination Disinfection, Chloroform, or any others. We also offer a wide array of other Water Filtration, Treatment & Conditioning systems which may effectively address your specific water conditions. If you are still uncertain about your specific water conditions, please call us at (Toll-Free) 1-877-284-5042 for a FREE Phone Consultation with one of our Water Filtration, Treatment & Conditioning Specialists. We will quickly discuss your water situation and then provide you with straight-forward answers and/or high-quality, affordable options to properly address your specific water conditions. Why is our HardnessMaster so popular? The HardnessMaster's advanced MaxConditioning™ technology has been tried and tested over the years, by a substantial number of U.S. and International consumers, so you can rest assured that you're getting a top quality system! MaxConditioning core technology has been tried and tested over the years, by both national and international consumers, so you can rest assured that you're getting a top quality system! If you feel that you don't know or you have questions about your water conditions, we recommend you call us (Toll-Free) 1-877-284-5042 for a FREE Phone Consultation with one of our Water Filtration/Treatment Specialists. We will quickly discuss your water situation and then provide you with straightforward answers and/or high quality affordable options to fully and properly address your specific water conditions. the "Order NOW Online " button above. Concerned About Other Contaminants In The Water? 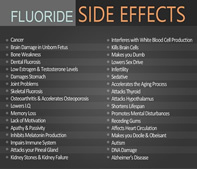 There can be many different contaminants in our water supplies today. Each of our water filtration units can be used as a stand alone filter. However, depending on the range and amount of contaminants in the water, one might find it necessary to use multiple filters in conjunction with each other. We strongly recommend getting a water test done and calling us for our FREE Phone Consultation before you purchase any water filtration system. How may we further help you? Click here to view some of the many contaminants found in today's water with our corresponding water filtration solutions. Free Expedited Shipping: Shipping is expedited to occur on same or next business day, depending on time of day order received. Shipping is 100% FREE anywhere in the world that is serviced by UPS or USPS (or US Mail). In general, HardnessMaster orders will be shipped via USPS Priority Mail, unless service is not available for that location. HardnessMaster™, MetalMaster™, Inline Chlorinator™, PureMaster™, ArsenicMaster™, MaxConditioning™, FluorideMaster™, Equinox™, and Vitasalus™ are trademarks of Vitasalus, Inc.
Used for many years, Review by Herb P.
I have used this product for years and wouldn't live without it! Thanks! Stopped all corrosion, Review by James I. Really noticed a difference, Review by Jared F.
I use your HardnessMaster product at my house and have really noticed a difference in my water. I work for a hotel company and am curious if you have commercial applications for hotels. Our water mains appear to be 3-4" in diameter. If you could provide options and pricing, that would be greatly appreciated. Plumber-recommended, Review by John C.
On recommendation from my plumber I purchased your Harness Master in 2009. To say I,am pleased would be an understatement, and I've recommended your product to both family members and friends. Our plumber was impressed!, Review by Carol K.
Just wanted to let you know that I finally got my Vitasalus PureMaster V-700 / FluorideMaster Combo and Hardness Master installed on 11/18/16. All is well and my water quality is much happier. Please note installation date for my warranty to begin. If you need a copy of the plumbing bill, let me know. FYI, the plumber commented on the quality of the system. I plan on giving them feedback after a fair months evaluation. At which time they may be interested in promoting your product. Impressed!, Review by David T.
I'm impressed after a month the hard water deposits are not appearing it seems to be working. We love it!, Review by Quincy R.
Great invention!, Review by Aaron J. Great invention - water is soft and the hard water spots are going away. We have added the Hardnessmaster Electronic Water Conditioner, with the V-700 series. This is amazing technology! It has changed the briny hard water of Florida into soft water that does not leave any calcium/lyme residue on the appliances or on the shower glass. After cleaning the glass shower so it is crystal clear - then using the shower for several weeks you will not have water spots that make the glass cloudy and hard to clean. It is so easy to clean the shower glass! I love this technology and have even told my plumber about it. 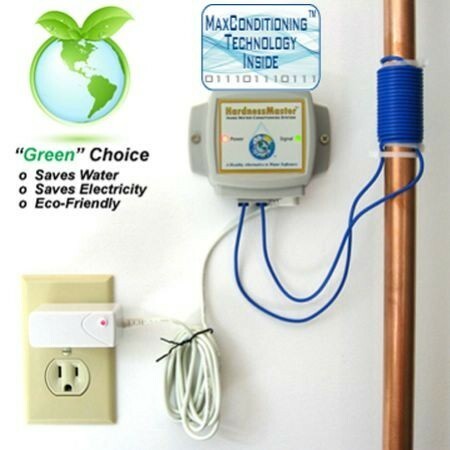 Save money and the environment from harsh chemicals and salt to soften your water - this system is all you need! Unbelievable Results!! !, Review by Lynnemarie S.
I live in the Albuquerque area. Hard water kills more hot water heaters than I can believe. My neighbors have all been through 3 in 16 years. I bought two of these and found 2 were even more effective. I put one on the main water pipe coming in, plus one on the cold pipe entering my on-demand water heater. At first, as the website mentioned, a large amount of white powdery stuff coming out of my pipes for about 3 months. After about 8 months, my dishwasher produced crystal clear dishes, and my glass shower walks no longer had such residue. You have to be patient, to be sure. One house I kept it on for a year before it all cleared up. It was installed there for 3 years. That house was 16 years old. It had been using a $6,000 salt softener that someone else installed. I promptly turned that off because I started noticing my blood pressure slowly rising. I never use salt in my food, so I guess I'm more sensitive. This house has taken a bit longer because it is 25 yrs old, but there are no water spots anywhere. Faucets clean, dishwasher, shower walls. very little shampoo or conditioner. When I was using the salt softener at my other house, my gray hair felt like straw and was turning yellow. Now I have clean pipes and no problems. Thank you so much!! !